You may have noticed a trend in this blog - I LOVE TARGET. Actually, I love finding the the cheapo goodies at any huge mass market store including Walmart, Christmas Tree Shops, Michael's, Kmart, etc.. And I'm not ashamed to admit it! So in keeping with the economic downturn news that is completely bombarding us, I present to you the "Goodies on the Cheap" blog entry. I'll bring these to you on occasion as I find them. Isn't it adorable? Its on the small side which makes it even more useful. It would be great as a keys catch all in a hallway table or serving up some cookies for guests. $13, available in store only. I showed my youngest Sophie your house all decked out for Halloween , she was so impressed, now I have left everything to the last moment this year , I really need to get in gear , today today I will go get some goodies and fun goolies. I would love to hear the reasoning behing leaving out letters , that is too funny. I am off to Zellers , which is like Target and Kmart . I LOVE that tray - I got one at Target a couple of weeks ago. I took it to a party with appetizers on it and everyone flipped out and I think they all ran to Target the next day looking for it. Really pretty and can't beat the price! Love it and now I need to run to Target. Why the missing letters though? i'm heading over to target tonight... i love that tray. great decorations too! 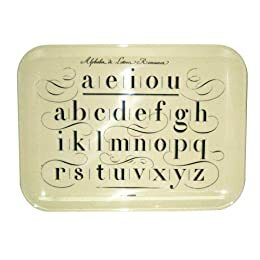 I love that tray, and saw it in a magazine recently...which one, I have no idea (a sign of too many magazines?). Yes, Target is just amazing for things like this. The John Derrian collection is just great! !